This apartment in the old town of Nice is close to the sea (about 300 meters) and situated in the pedestrian area. Near of the main bus station from where you have easy access to all areas of the riviera for one euro only and also day bus trips available to the mountains in winter for skiing. You are about 5 mn by walk from the Acropolis Convention center. Fantastic location. Well equipped. A true sense of style. Located in the old town, but only minutes away from both the beach and the shopping streets of the town centre, this splendid appartement surely has the best location of any in Nice. 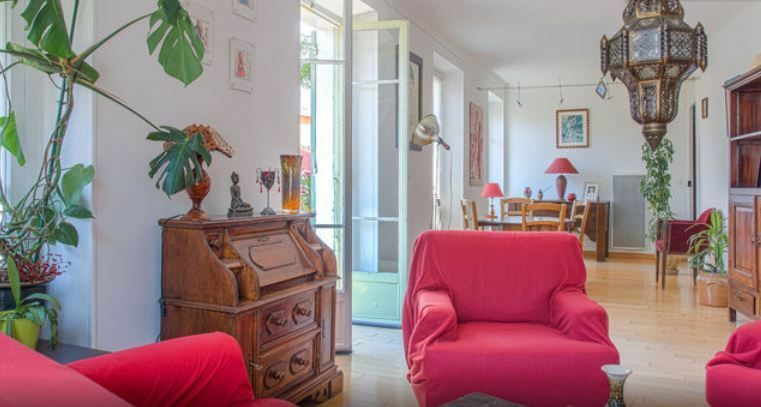 And, even better, the appartement is superbly well-equipped and possesses real character. All in all a very relaxing place to stay. And, to top it all off, the owners are warm and welcoming and they really want you to have a fantastic time. All in all this is s no-brainer. Book now. Nice family staying one week in my apartment. I am so happy that they have a nice time during this week. Hope to see you again Darrel !!! Excellent location with everything you need very close. Trams and buses are minutes away. Nathalie & Yan are ever helpful and friendly, emailing us during our stay to check everything was ok. This is our third stay in this beautiful and very clean apartment which is perfect for us. Highly recommended and would not hesitate to stay again, thank you. This is the third stay of Geoff and this family in our apartment and it is with a lot of pleasure we welcome them. Very nice small family !!! Perfect location! Everything we needed. This clean, spacious and attractive apartment was a pleasure to stay in! Nathalie and her husband were helpful and there was good communication. There's a supermarket on the little square, a wine cave with a great selection, happy hour and tapas on the bar on the corner and a great little bakery round the corner. We had planned to use the train (station 15 mins away) but the buses were much cheaper, a quicker walk and much more convenient. This apartment is a great base for exploring the old town. We'd definitely recommend it. We are really happy that you enjoy our apartment !!! We had a lovely stay at this apartment in the heart of the old town in Nice. It's location is perfect for access the the old town, tram and bus routes and a short walk from the beach. The owners are very friendly and helpful. The apartment was clean and tidy. Would recommend highly. There are lots of stairs and a little noise from the church bells and diners below but this was ok for us. Nice people stay in my apartment, i really appreciate !!! We thoroughly enjoyed our week stay here. The apartment is light and airy as well as feeling quite homely. Facilities were as described and it was clean. Nathalie and Yan were very welcoming and informative on arrival and even emailed whilst we were there with a suggested place to visit. Would definitely stay again! We are really happy with my husband that you enjoyed your stay in our apartment. Hope to see you again one of this days. We stayed in this apartment for a second time as we enjoyed it so much in 2013. We stayed there nine nights with our two daughters, 22 & 24 yrs. The location is as good as it gets in Nice. The period facilities are excellent and we would recommend the apartment. The owners met us when we arrived and departed and are very helpful and friendly. Many thanks Geoff. We really enjoy with my husband that you stay for a second time in our apartment with your family. Nice is a major city on the Côte d'Azur behind you have the beautiful French Alpes. Magical location in Nice. Few minutes to beach and world-famous 'Cours Saleya'. In the old town just between the 'Place St François' and the 'Place Garibaldi', you will be totally immersed in the local lifestyle. This apartment is facing south so you have the all day sun. Security deposit if you stay less than one month is required : 300 euros or the equivalent in British Pounds. Security deposit have to be pay in cash on arrival. Linen, towels wifi included in the price. . Internet access Please email for alternative pricing options for less than 3 week stays.